Life without Tyondai Braxton is rough for Battles. That’s a sentiment notoriously reiterated since his departure from the band in 2010, leading up to their second full-length release Gloss Drop. Whereas they attempted to compensate, to varying effect on that album, allowing a wide range of singers, from Yamatsuka Eye to Gary Numan, time to shine, La Di Da Di does not, existing as a vapid space of Math Rock monotony. It’s a genre largely dependent on fun, without it the sounds reside in a static hold of unimaginative white noise. Like the chirping chipmunk vocals on ‘Atlas,’ the improvisational pace-setting on ‘Tonto,’ or the progressive grunting and thumping on ‘Ice Cream,’ Math Rock, and Battles as leaders of the genre, needs to be wacky, weird, and idiosyncratic to flourish. With La Di Da Di, Ian Williams, John Stanier, and Dave Konopka attempt a vocal-less journey, relying solely on the already narrow range of instrumentation they currently utilize, resulting in an album meant to be fun that exhibits none of it. It’s structured, emotionless Math Rock, programmed and forced into existence, done off need not want, with a heart that beats robotically not organically. The album doesn’t originate like that though. ‘The Yabba’ is refreshingly dense, an appropriate song for lead single. Each musician provides stellar work here, complimenting the whole as segments move fluidly within each other, acting as a quick summation of the album as a whole. It might move too sporadically and may last too long but ‘The Yabba’ is by far the best track here, starting with an intense build-up that lasts minutes as anticipation builds. The dripping guitar effects, the deeply-rooted drum kit, and the hyper-orchastrated keyboard work all manifest wonderfully, the latter an impressive showcase of one of Rock’s best keyboardists in Ian Williams. Unfortunately, apart from a few occasional instances of inventive creations, the rest of La Di Da Di is entirely lifeless. While I don’t want to say it’s because of a lack of vocals, a large part of it is because of a lack of vocals, or at least what that alternate approach brings to the music. Where there’s a voice present Battles seem to want to compete, as if the vocalist brings out their willingness to try something new. It’s like ‘Rainbows’ or ‘Bad Trails,’ where offball characteristics would flow freely between Braxton’s non-linear vocal patterns. Without that, there’s nothing to build off of, leaving a bland slate of templates covering La Di Da Di. There are some interesting moments littered throughout, but they’re too inconsistent to manifest into something tangible. Both the dots, ‘Dot Net’ and ‘Dot Com,’ offer warped, farty synths padded by Konopka’s layered effects, creating an animated world that bounces, jitters, and jukes. These creative juices only pump every so often though, with the majority of songs slugging by off their own perceived weight. Don’t get me wrong, most cuts here are meaty and buoyant, but with nothing forcing them to expand they remain in a solid state incapable of fluctuation. In comparison to Mirrored and some larger cuts off Gloss Drop, everything here seems dormant, like in a perpetual state of gearing up, just never going off the cuff, leaving a distinct taste of wanting more. Nothing feels warranted, with a bevy of tracks simply existing for no other reason than they must. While ‘The Yabba’ and closer ‘Luu Le’ feel like something that would perk the ears, everything else grazes by, in one ear and out the other. Tracks like ‘Tricentennial’ and ‘Non-Violence’ feel inherently comatose, with the way they trudge by you’d picture the band just despondently echoing the notes and structure laid down before them passionlessly. Much of the album feels this way, devoid of fiery fervor, at least in comparison to their previous efforts. It’s a shame too, considering the musicians behind the music are some of the most talented to hit the Math Rock scene. You watch them perform live or in their music videos and you see this skill pour out onto the instruments. Rigid, concise drum processions, fast-fingered keyboards transitions, and tightly-tuned guitar quips litter their music, and that’s not lacking here. Moments are filled, too much at times, with these intricate layerings, a prime example being ‘FF Bada,’ with its dynamic adjustments covering its scope. Now it doesn’t offer Battles’ stereotypical charm, lacking significantly with its robotic progression, but each individual part is like a tour-de-force in textured artistry amongst each respective instrument. A lot of tracks here possess this over-production, as each side comes full throttle with nothing intermediate to compensate. Whereas Mirrored’s exclamatory moments were met with slow burning hangover’s, La Di Da Di remains at a fair pace throughout its 12 tracks, failing to rise and fall naturally enough to allow for intrigue. With their seemingly acknowledged decision to avoid vocals, Battles risked everything by hinging solely on their talents as musicians. While the virtuosity is there, the passion isn’t, resulting in a sad collection of tracks without a beating heart. No laced effect captures the imagination, and while intricate melodies find their way into the album they aren’t catchy or addictive enough to fascinate. 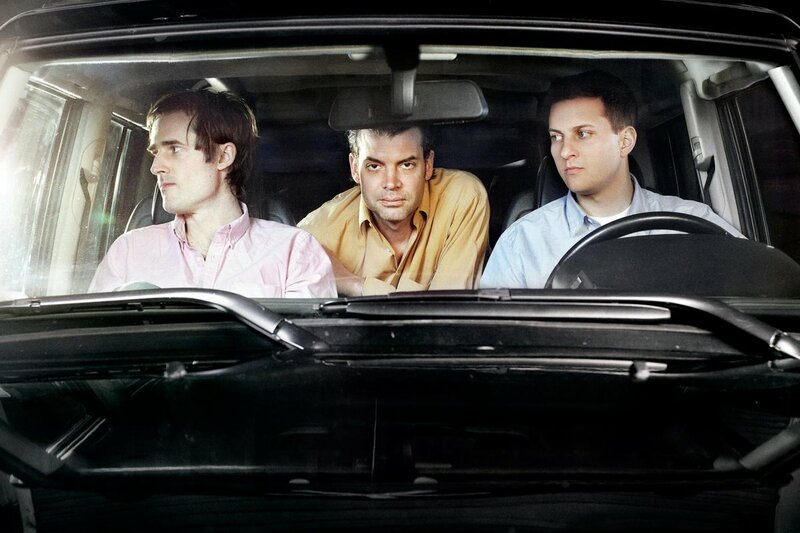 It’s as if Battles wanted an album fully exposing their talents but forgot where the joy lied, as the Pop element largely present in their first two LP’s are absent here. Each track, apart from a few standouts, feel nothing more than deep cut fodder, an entire album composed of which can cause immediate failure. In a certain setting, like a dance party or video game soundtrack, La Di Da Di may work with a fair output, but without that given context it fails to leave a mark. Like I mentioned before, it exists because it has to, not because it wants to, as their typical four year gap was up. Even as a skeletal backbone for additional fun, La Di Da Di is unremarkable, the medley’s hardly memorable, the sounds and what they do with them inadequate, the overall presentation substandard to the events previous Battles albums used to be.